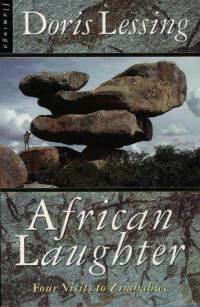 I read African Laughter - Four Visits to Zimbabwe no more than a week after finishing Dervla Murphy's The Ukimwi Road. At first, it was impossible to resist comparing the two: the same area, the same time frame (give or take a decade), even the lady writers represent the same generation - more or less. Initially, I judged Murphy's version of reporting far superior (and if forced to make the comparison again, I'd stick to this verdict) but a hundred or so pages into Lessing's book I cancelled the contest. Similar at first sight, the two perspectives are simply too different to compete. While Murphy only passes through the countries she describes, Doris Lessing has personal ties with Zimbabwe. This is where she grew up, where some of her family remained and from where she was banished for political reasons for many years. Her 'four visits' could be labelled as 'return from exile', even if short-termed and accomplished in instalments. Because of all this, African Laughter is first and foremost a memoir. Sure, some elements of travel writing are present, and you can learn quite a few things about Zimbabwe as it was in the '80s, but you get to know Doris Lessing far better than the country she's visiting. Which, depending on your point of view, can be a good or a bad thing. I started off expecting a travel writing piece, so I was somewhat disappointed, but Lessing's writing style did a lot to soothe my pain. Sure, it's chaotic, and guilty of some very original punctuation (two colons in one sentence? ), but it is also mature, elegant and full of perceptive observations about human nature. Definitely not fluff. Only halfway through the book I found out about Lessing being a Nobel prize recipient. Quite a surprise! While pleasant, her writing is not exactly Nobel-level, not in my book. On the other hand, I probably should stay such judgements until I sample some more of Lessing's bibliography. After all, African Laughter is only a tiny fraction of her literary accomplishments. I'm looking forward to trying some more.